Speak up for the birds and wildlife of the Arctic Ocean! Tell the Department of the Interior that the Arctic Ocean should remain off-limits to oil and gas drilling. Please add your voice to the public record by sending the sample letter provided below, or edit the letter with your own words so that your comments have even greater impact. Comments are due by February 8. 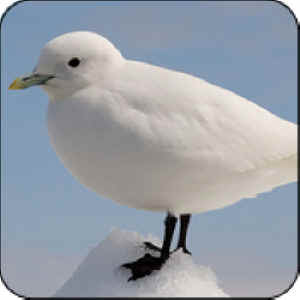 Only one of MANY creatures who face devastation from oil drilling, the Ivory Gull, an Arctic-dependent species, spends its life on and around the sea ice. It feeds in open water and on the remains of marine mammals killed by polar bears and other predators. The ocean waters along Alaska's northern coast provide vital habitat for extraordinary wildlife, including polar bears, walruses, ice-dependent seals, endangered bowhead whales, and millions of migratory birds. The Arctic Ocean can also be phenomenally harsh: broken ice covers the water for much of the year, storms with hurricane-force winds can whip up 20-foot seas, and it is entirely dark for half the year. The federal government recently released a proposed Five-Year Program (2012-2017) for offshore oil and gas leasing that could open up pristine new areas in the Arctic Ocean offshore of Alaska to oil drilling, even though the oil industry has never successfully demonstrated the ability to clean up an oil spill in the Arctic Ocean. I am writing to ask that you remove the proposed Arctic Ocean (Beaufort and Chukchi sea) lease sales from the recently released draft federal offshore oil and gas Five-Year Program for 2012-2017. If we have learned anything from the Deepwater Horizon disaster, it is how unprepared the oil industry is to respond to a spill. The oil industry has never successfully demonstrated the ability to clean up an oil spill in the Arctic Ocean, and the nearest Coast Guard station is about 1,000 miles away! The ocean waters along Alaska's northern coast provide vital habitat for extraordinary wildlife, including polar bears, walruses, ice-dependent seals, bowhead whales, and millions of migratory birds. The Arctic Ocean is also phenomenally harsh, covered in broken ice for much of the year and subject to storms with hurricane-force winds and 20-foot seas that would make spill clean-up impossible. There is also a basic lack of scientific understanding of the Arctic Ocean ecosystem as documented by the U.S. Geological Survey's recent "scientific gap analysis." Before putting the Arctic Ocean at risk of a disastrous oil spill, a comprehensive research and monitoring program is essential to understand the Arctic Ocean ecosystem and to identify sensitive areas for permanent protection. The Department of the Interior should remove the proposed Arctic Ocean (Beaufort and Chukchi seas) lease sales from the draft 2012-2017 Program. The department should focus on development of effective oil spill clean-up capabilities and implementation of a comprehensive scientific research and monitoring plan to identify and protect sensitive areas in the Arctic Ocean.